Forestry authorities in Southwest China's Sichuan Province have issued a notice banning visitors from getting close to giant pandas, including the prevalent practice of paying to have pictures taken with them. The notice, issued by the Sichuan provincial forestry bureau, said that facilities that keep captive pandas in the province should not organize activities that allow people to get close to pandas for commercial purposes, such as feeding or taking pictures with them, the Xinhua News Agency reported Thursday. "This answers the call that panda supporters in China have been making for a long time to ban such commercial activities for the sake of protecting pandas," Zhao Huawen, founder of the Eudemonia Bank, a Chengdu-based organization dedicated to protecting panda habitats, told the Global Times on Friday. 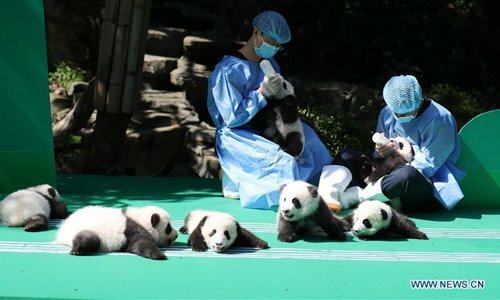 Since surveillance cameras have been installed at the Chengdu Research Base of Giant Panda Breeding, which livestreams 24/7, many panda fans were infuriated when they saw visitors taking pictures with pandas, Zhao said, adding that there have been constant appeals to ban tourists or celebrities from getting close to the endangered animals, because they may pass on diseases. In January 2015, a captive panda died at a research center in Northwest China's Shaanxi Province, after it became infected with an unidentified disease, Xinhua reported. In early January, pictures posted online showing some visitors posing for pictures with pandas at the Chengdu base sparked heated discussion online. Some netizens posted that the center charged 1,000 yuan ($143) per person to take photos with pandas. However, the base previously denied the claims to the Global Times, saying it did not allow the practice. Only breeders, veterinarians and researchers are allowed to get physically close to pandas, it said. The State Forestry Administration issued a notice in 2015 stipulating that tourists are forbidden from having close contact with endangered animals. The notice said that these facilities must put pandas into quarantine for more than 60 days if an animal has been transferred from another facility or rescued from the wild. These pandas will not be introduced into feeding areas until they have passed the quarantine period.